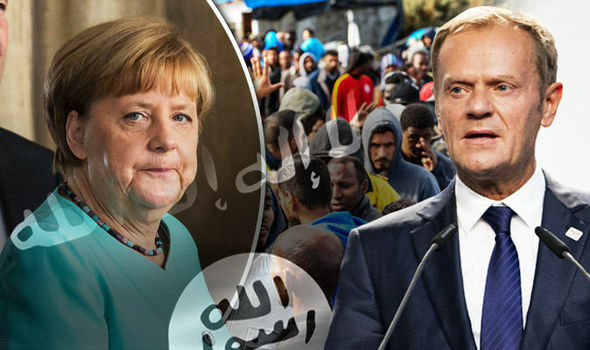 (Daily Express) EUROPEAN Union (EU) bosses have blamed Angela Merkel and her open-door policy for the migrant crisis and Islamic State (ISIS) terror attacks on the continent. As the remaining 27 European Union leaders attempted to put on a show of unity at a summit in Bratislava, Slovakia, Donald Tusk, president of the European Council hit out at the German Chancellor. He said she created chaos in the region by welcoming 1.1million Syrian migrants last year. Mr Tusk blamed “political correctness” for delays in closing Europe’s borders in 2015 which allowed more than a million into the continent unchecked, including ISIS jihadis who attacked Paris and Brussels killing 130 and 32 people respectively. Mrs Merkel was forced to listen to EU leaders ripped into her - destroying the unity leaders of the EU are attempting to portray as they meet to talk about the future of Europe after Britain voted in June to leave the bloc. A note to diplomats before the summit from Mr Tusk urged the EU “never to allow return to chaos of last year”. In the invite, he referenced “last year’s chaos on our borders” in reference to the crisis made worse by Mrs Merkel’s decision to open up Germany’s doors to Syrian refugees. He wrote: “New images every day of hundreds of thousands of people moving across our continent without any control, created a feeling of threat among many Europeans. “They had to wait too long for action to bring the situation under control.